RamboTM PT Dry Core Bits 1-1/4" up to 2"
RamboTM PT Dry Core Bit. 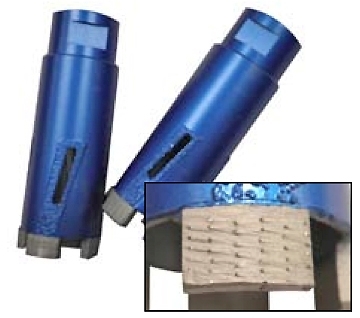 A fast cutting dry core bit, the Rambo PT Dry Core Bit features Patterned Diamond Technology. This technology distributes diamonds equally in layers Dry throughout the segment resulting in consistent, fast cuts. For use in cutting granite or engineered stone.